My cousin called wanting a stroller cake. So I started it and the next day walked in and found the hood I made out of royal icing collapsed. I called her and told her so we came up with this idea. A baby in a pumpkin. 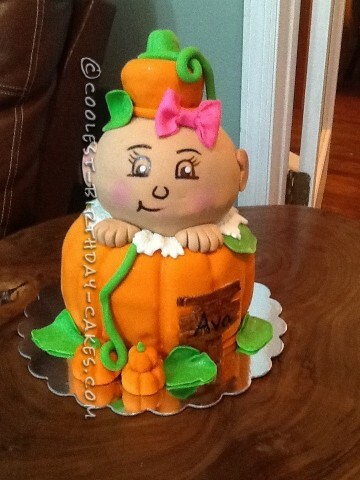 I used a soccer ball 2 piece pall pan to make pumpkin and baby head. I put buttercream on then dyed fondant, and used fondant ball tool to put grooves in fondant to look like grooves a pumpkin has. Then flesh tone fondant and painted on the eyes nose and mouth. I put a pink bow cause it’s for baby girl. I used cupcake tops for hat, covered it with fondant and painted stem green. Added vines and leaves and wooden post with her name on it made of fondant. I am pleased how it turned out. She was happy and so was I to turn disaster into a beautiful cake. Birthday cake idea posted by Trace P.
This is Louie – My Roasted Pig Cake!